FastRawViewer | We needed it. We made it. We share it. 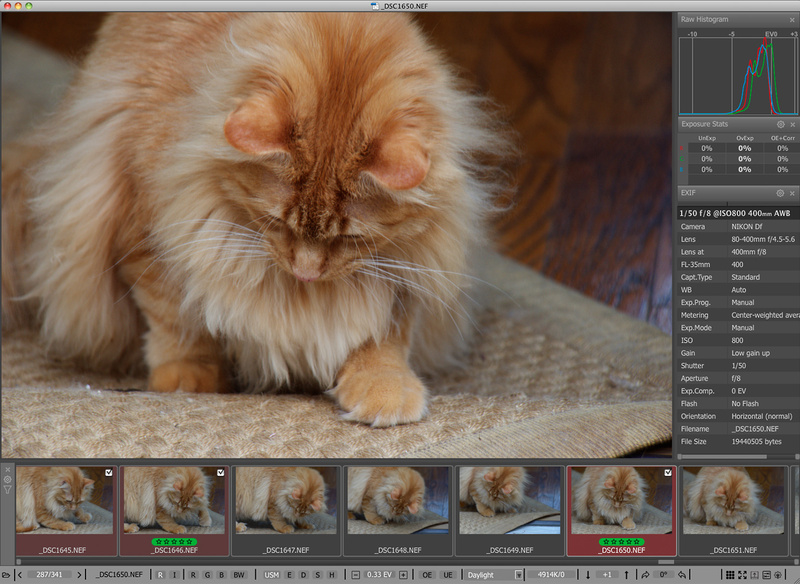 Is your RAW converter slow while building 1:1 previews or culling RAW files? 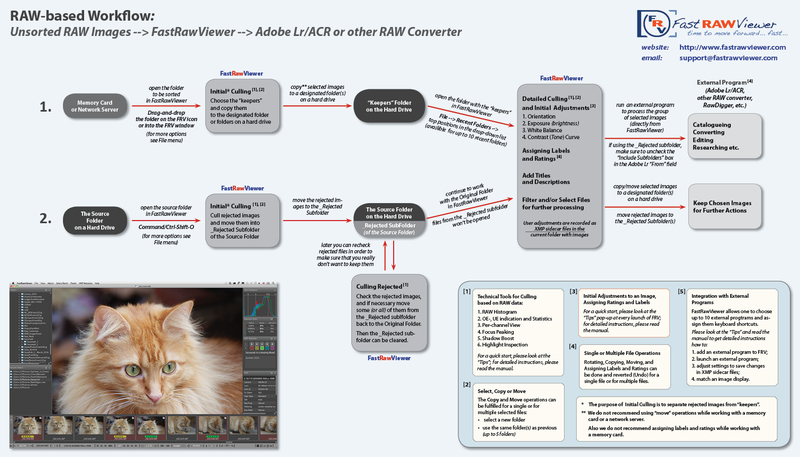 Use FastRawViewer - a great time-saver and an ideal RAW workflow helper. FastRawViewer opens RAW files extremely quickly and renders them on-the-fly, instead of just displaying embedded JPEGs. 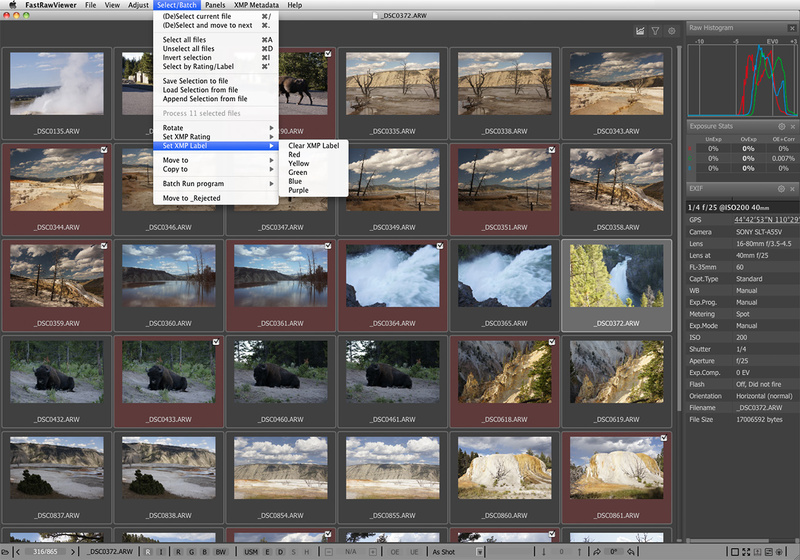 It allows a photographer to see the RAW exactly as a converter will "see" it, without any delays or waiting time, guaranteeing the possibility to sort and cull RAW images lightning fast and based on the quality of the RAW itself, not JPEG previews. 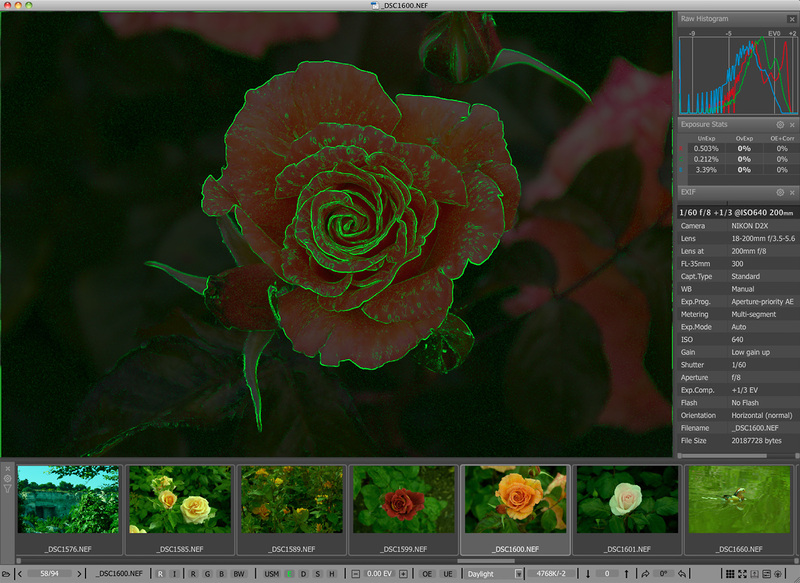 FastRawViewer's RAW-based tools (unique ones such as RAW histogram, RAW statistics, Shadow Boost, Highlight Inspection, Focus Peaking, per-channel view, as well as familiar ones like Exposure Compensation, White Balance, Contrast Curves) allow one to estimate what a converter will be able to squeeze from the RAW image data and make preliminary adjustments to the RAW file, which will be acknowledged in Adobe converters. 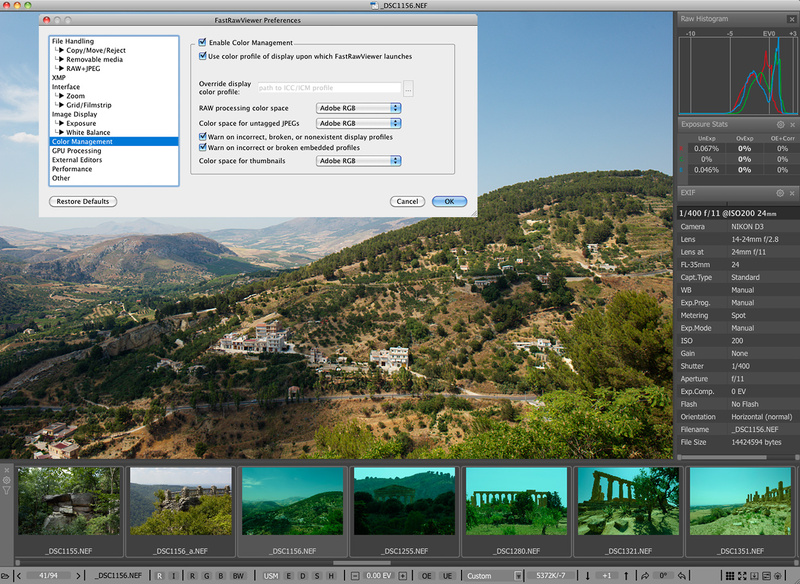 FastRawViewer provides tools for the rating, labeling and sorting photos, and filtering of any number of RAW images. 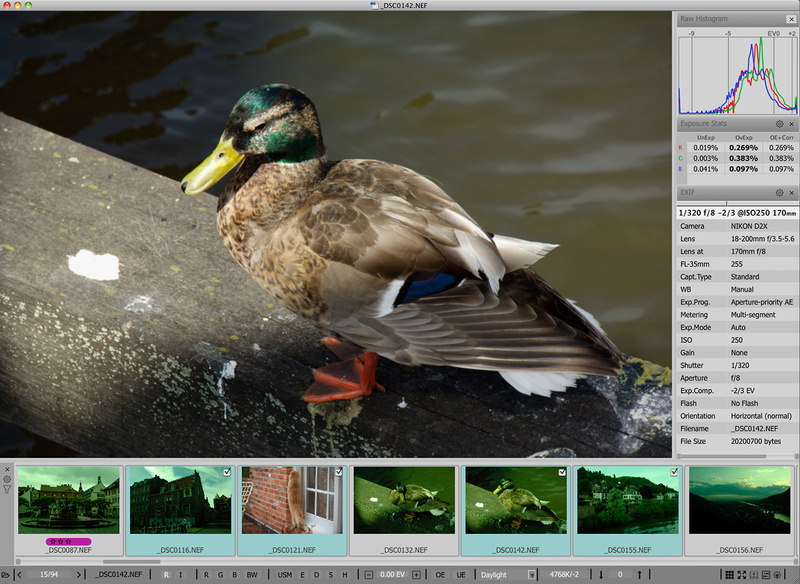 FastRawViewer supports a variety of RAW, JPEG, TIFF, and PNG formats. 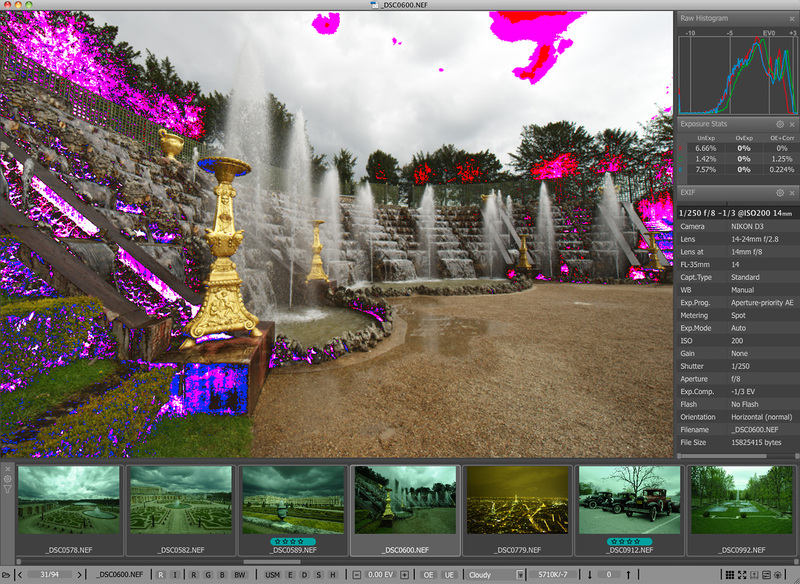 FastRawViewer is very user-friendly and seamlessly integrates into any existing RAW workflow. It is extremely flexible; nearly all of its settings can be tuned and keyboard/mouse shortcuts can be changed according to individual habits and preferences. 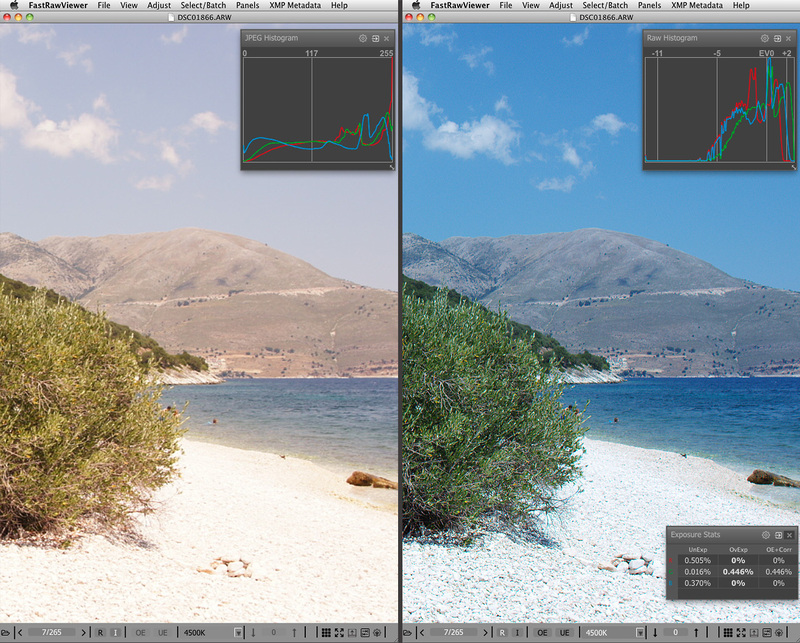 A JPEG's preview and a JPEG histogram can be very deceptive. 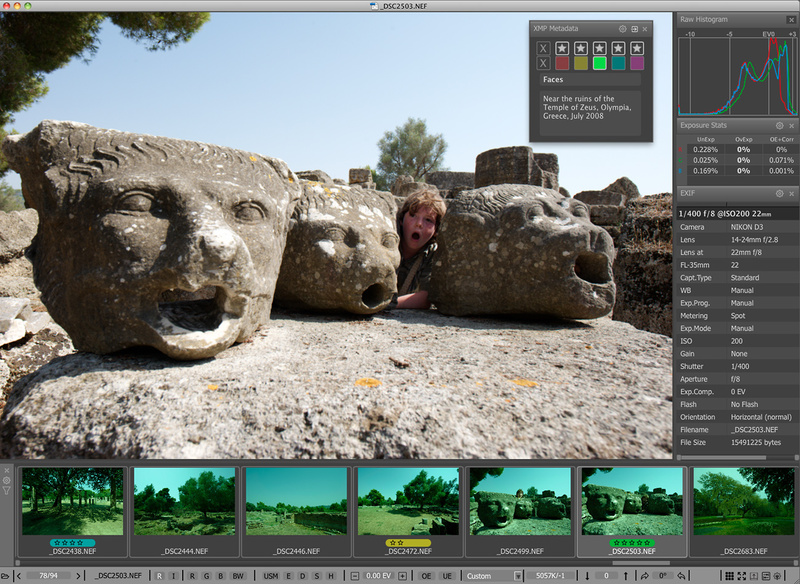 Look below; each of the pictures demonstrates two previews of the same shot – one is an embedded JPEG with a JPEG histogram (left part of the picture) and the other is from the RAW data with a RAW histogram (right part of the picture). Will you choose to keep the shot, looking only at the left part of the picture? 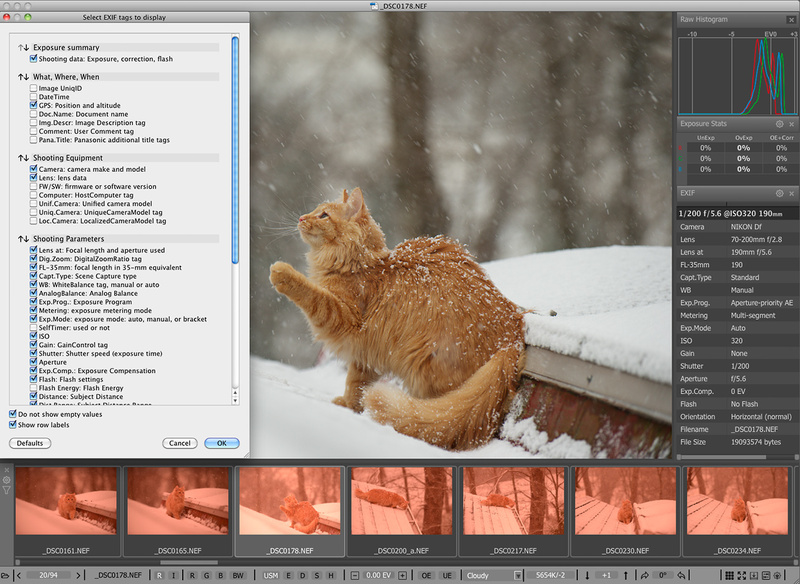 Other viewers will show just the embedded JPEG or an uncontrolled conversion of a shot (left part of the picture). 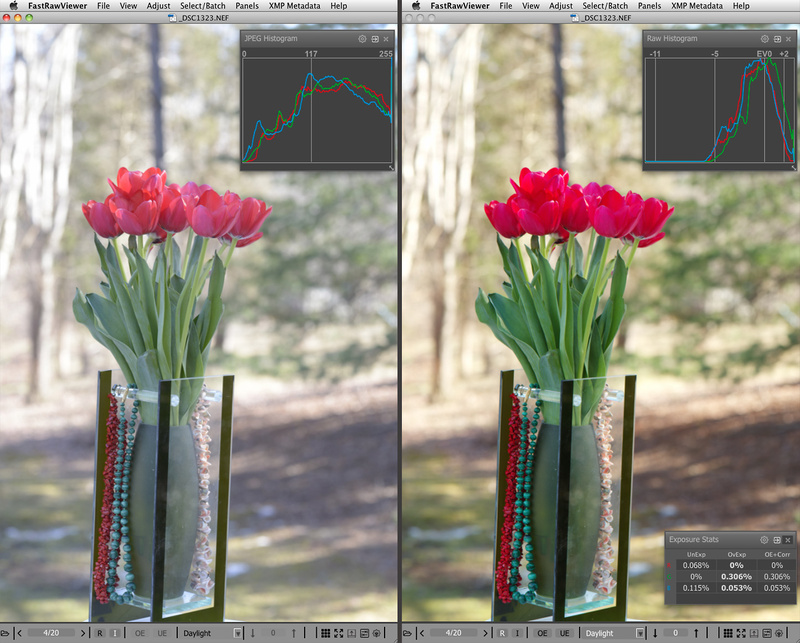 Only FastRawViewer displays RAW as the camera captured it and as RAW converters will "see" it (right part of the picture). 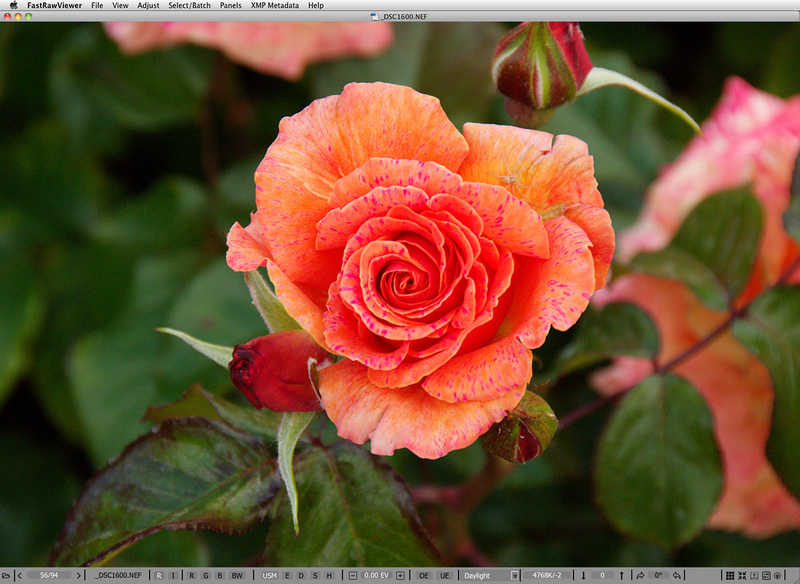 based on RAW data and not on the brightness of some uncontrolled render or embedded JPEG. What is the possibility of making a mistake when culling RAW shots based on the JPEG previews? Shooting RAW, and evaluating it based on a JPEG preview is akin to making a definite conclusion about the exact shape of an object based on its shadow on a wall. 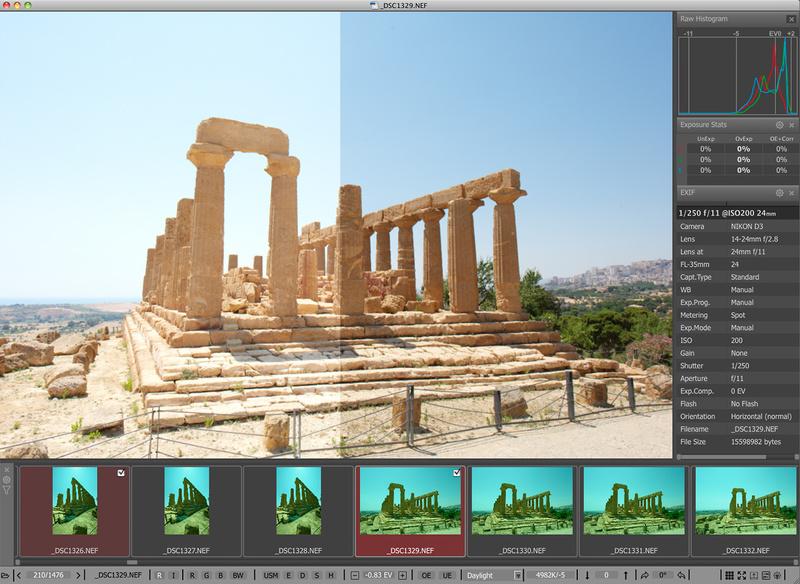 This is often used as an explanation as to why it is “only natural” that most image viewers display some render or embedded JPEGs instead of RAW, JPEG-based histogram instead of RAW histogram, and over- and underexposure indicators derived from JPEG previews. 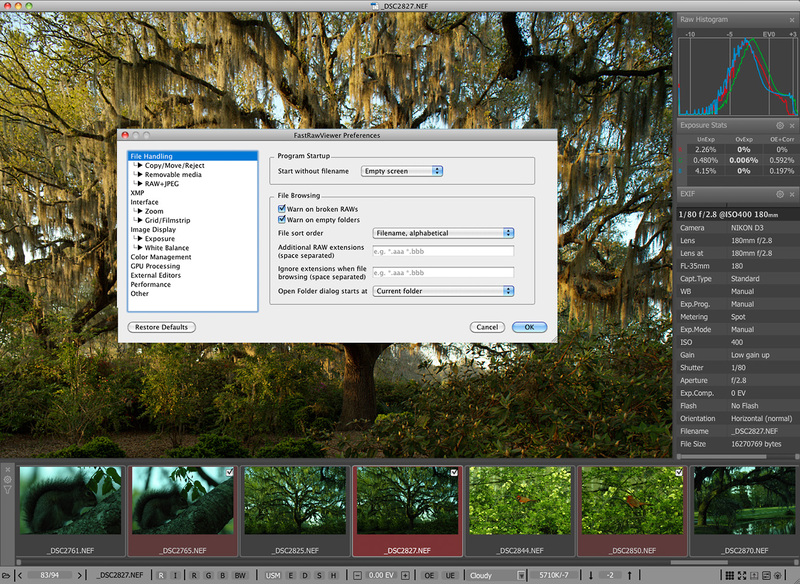 Using a RAW converter as a culling tool is an extremely time consuming endeavor, not to mention other serious inconveniences, such as uncontrolled collection growth which slow down the overall process and creates constant optimization and maintenance requirements. 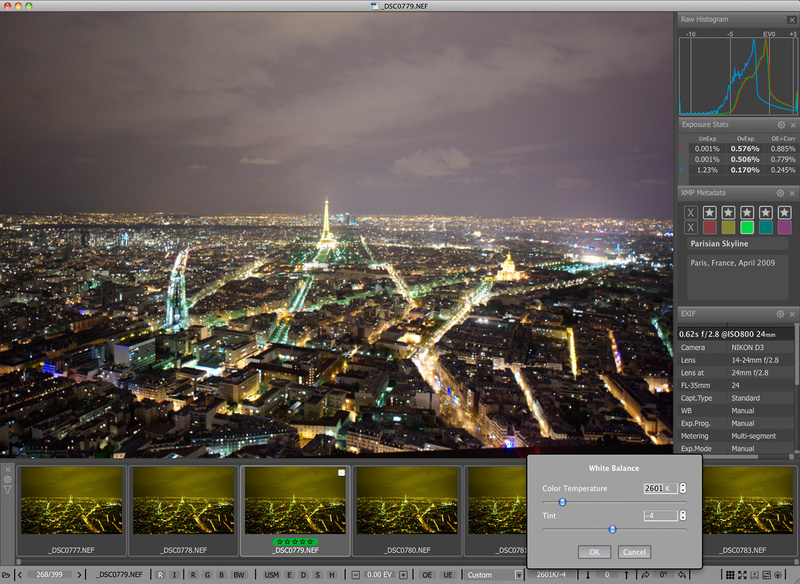 and not just with an embedded JPEG or an uncontrolled RAW conversion. OE- and UE Indication and Statistics allow for the immediate review of clipped highlights and plugged shadows based directly on RAW data. 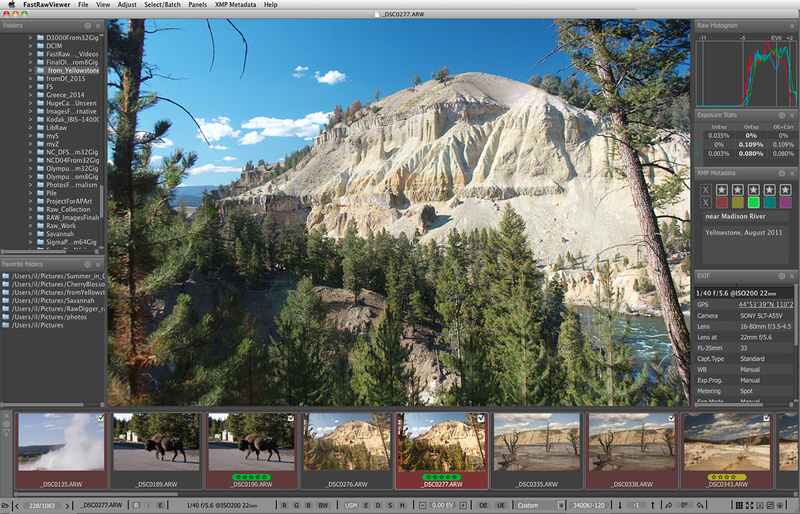 The real RAW Histogram allows one to evaluate whether the dynamic range of the scene on the shot fits within the camera's dynamic range. Focus Peaking highlights in-focus areas (Edges), and highly detailed areas or areas with high noise level or false details (Details). 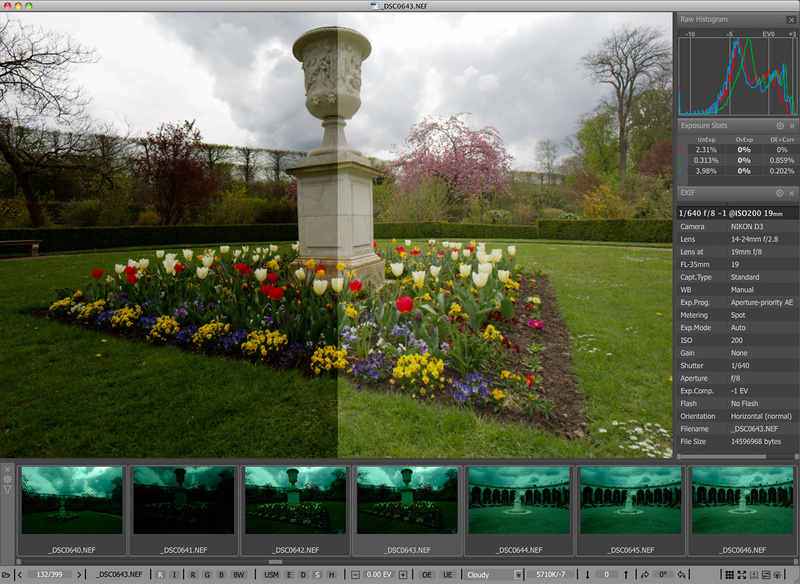 Shadow Boost allows one to lift shadows and bring out details, or evaluate noise level in shadows. Useful for image presentation and evaluation. 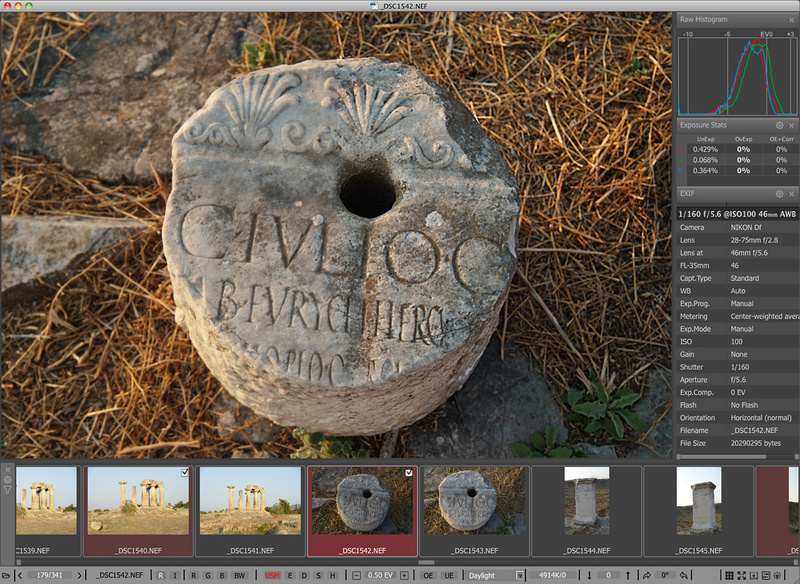 Highlight Inspection dims the shadows/midtones, and increases the contrast in the highlights in order to evaluate the details in the highlights. Per-Channel View allows one to evaluate the noise level as well as over- and underexposure amount and areas for every channel separately. 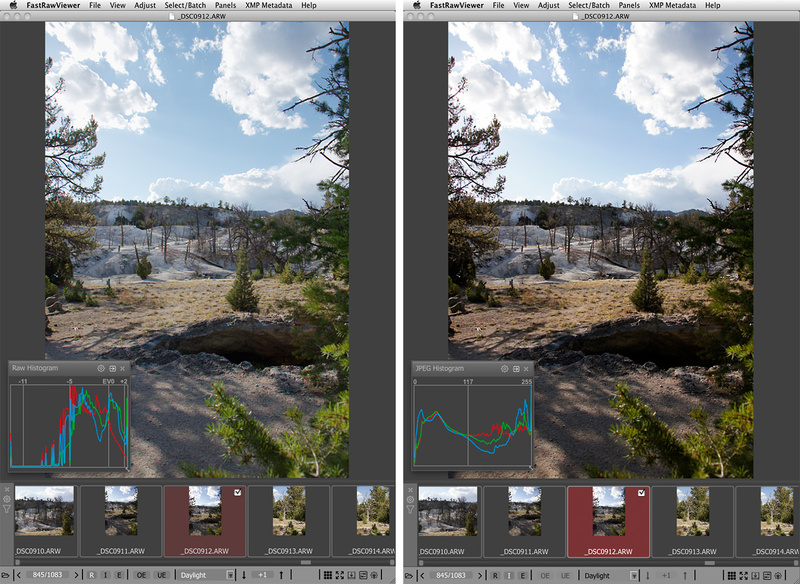 Exposure Correction allows one to adjust the overall image brightness; adjustments are recorded in XMP files, so Adobe Lr/ACR will go from there. 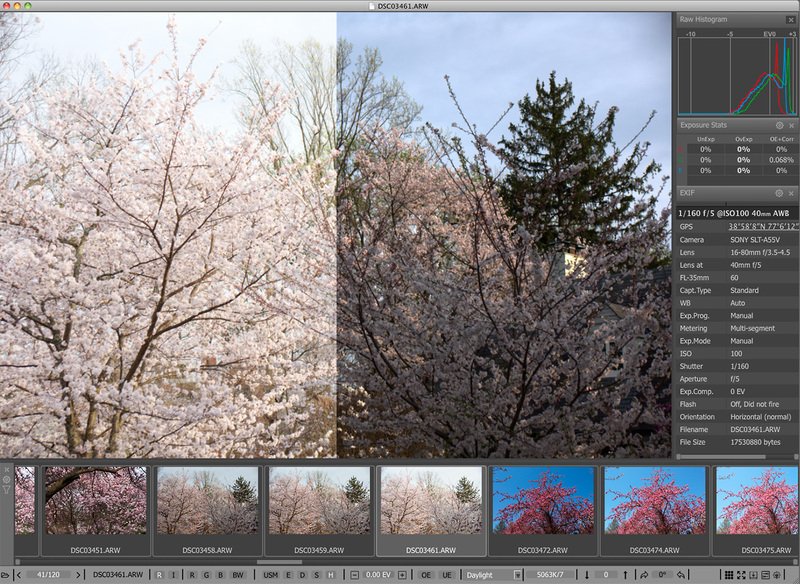 White Balance allows one to adjust the overall image color; adjustments are recorded in XMP files, so there is no need to repeat them in Adobe Lr/ACR. 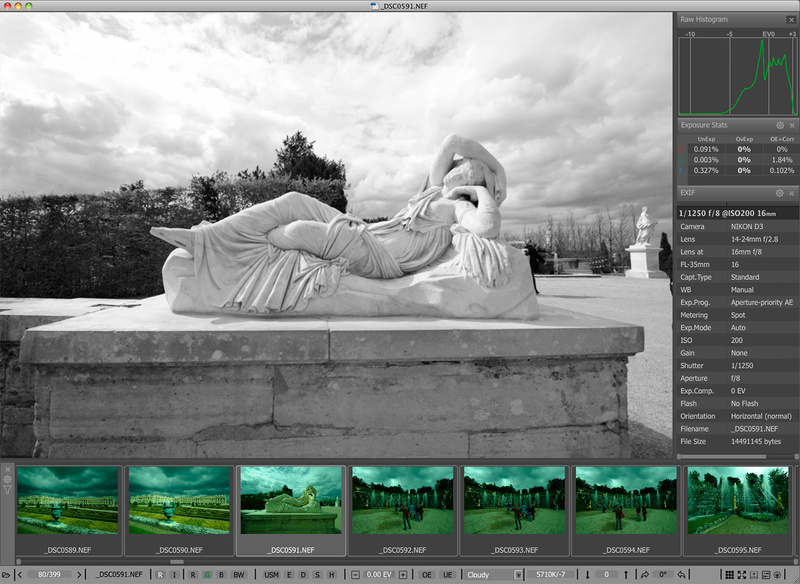 A variety of Contrast (Tone) Curves allows contrast control, increasing and decreasing it as necessary for image presentation and evaluation. To spare your time adjusting series of similar shots (sports, panorama, etc. 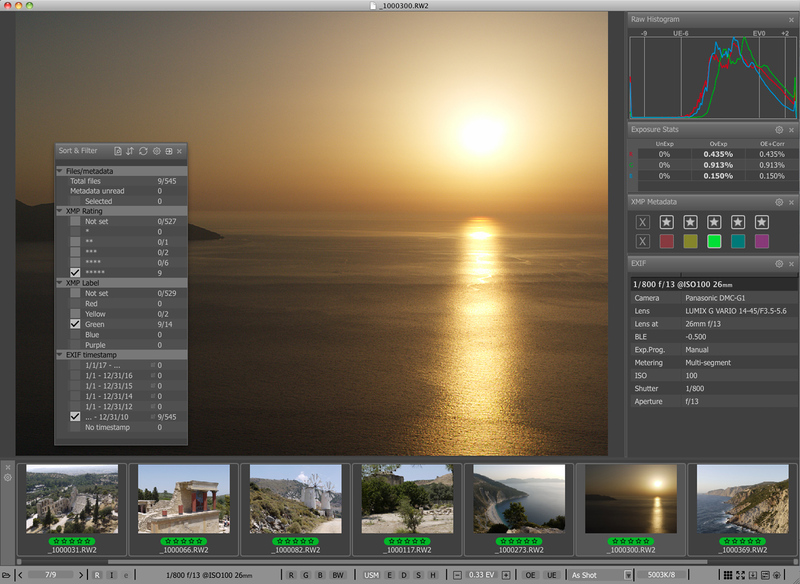 ), FastRawViewer allows one to propagate exposure correction, white balance and contrast curve adjustments made for the first shot to all shots in series. 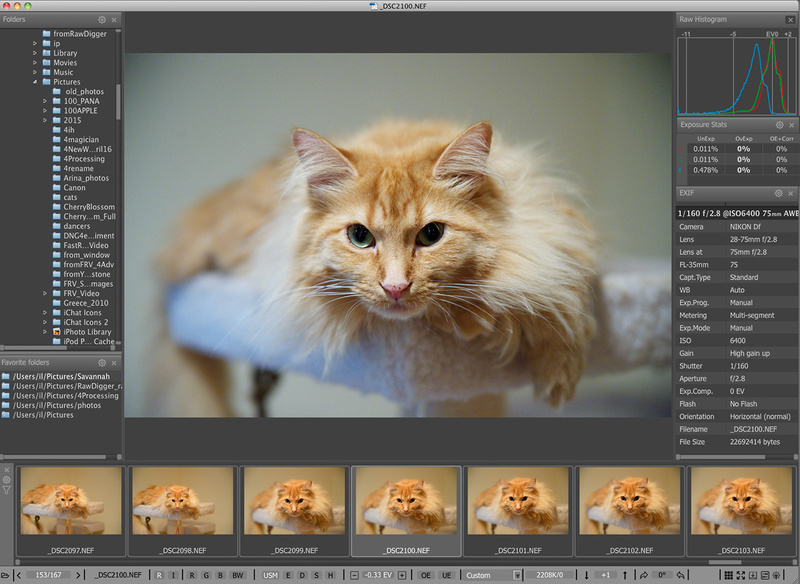 Exposure Correction, White Balance, Contrast Curves, Shadow Boost and Highlight Inspection allow one to adjust the look of the RAW image on the fly. Want Image to be Sharper? 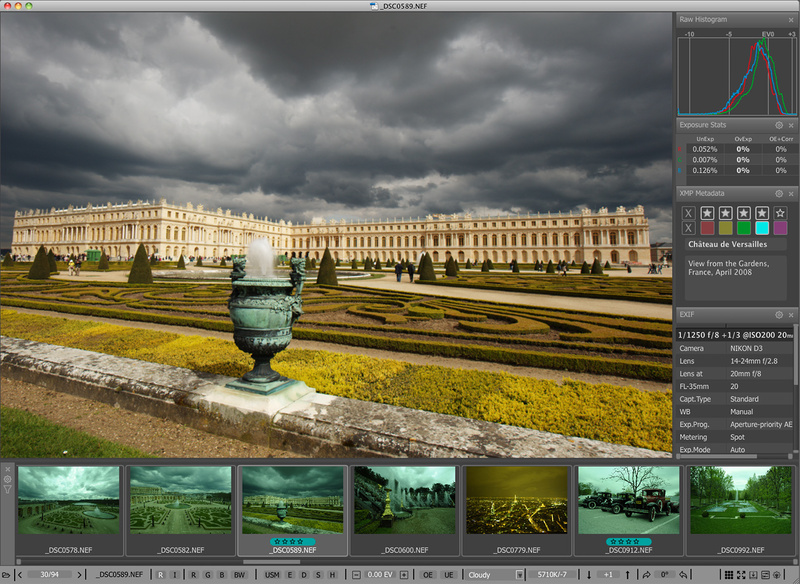 Two presets for Sharpening for Display allow one to immediately sharpen the image as well as evaluate what can be done in the conversion stage. Want it in Black and White? 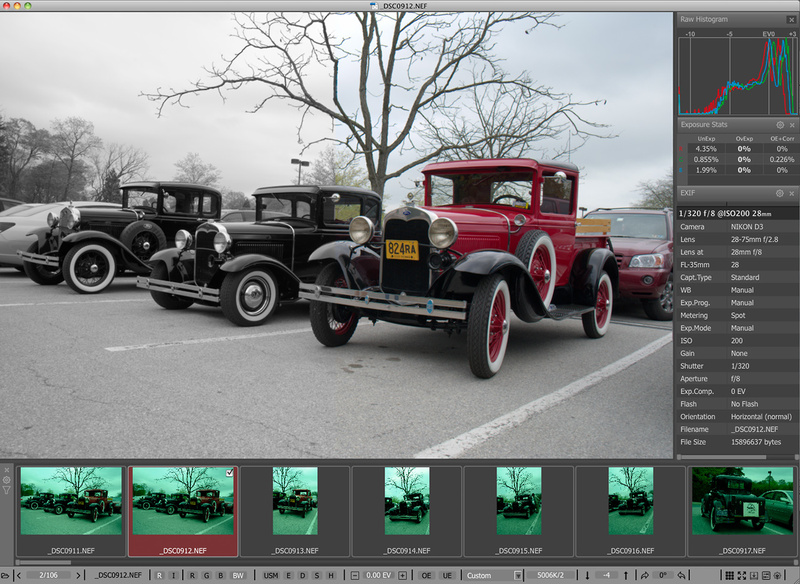 Black and White Preview gives one an idea as to how the image will look in black and white. Per-channel view is also available in this mode. One keystroke switches between Grid and Single File View modes. 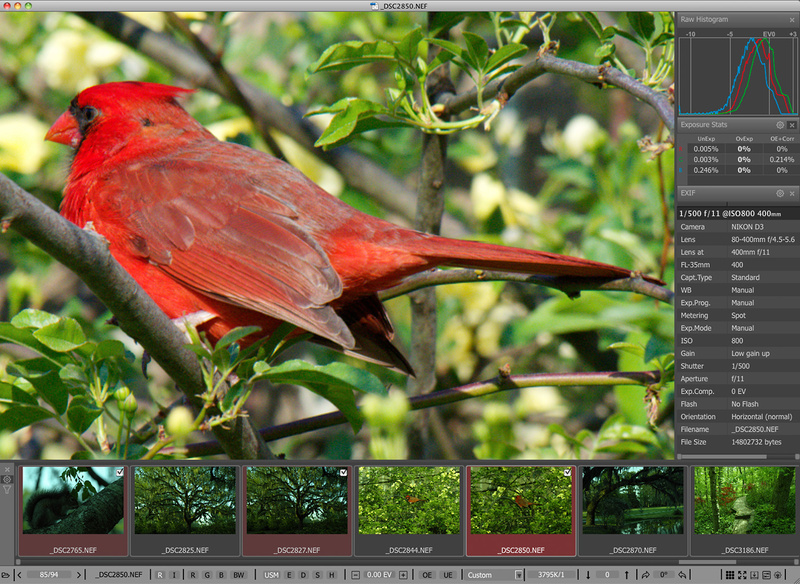 Evaluate the RAW histogram, Statistics and EXIF data for an image - even in the Grid. 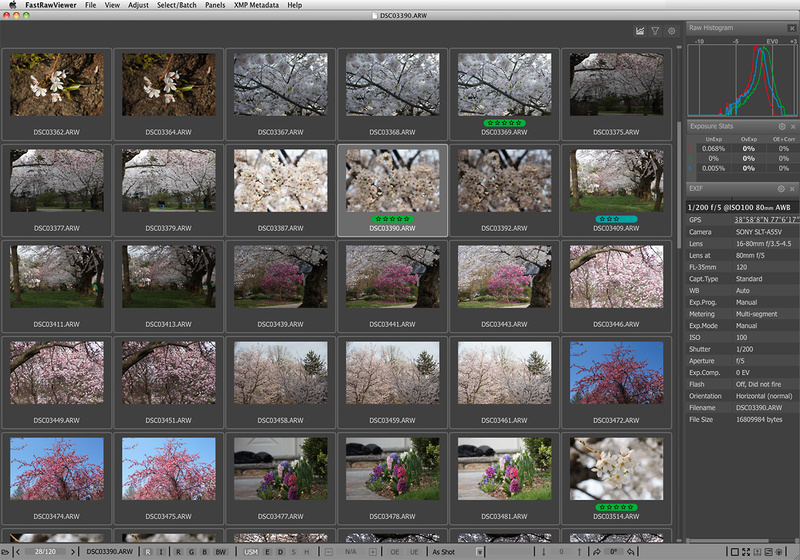 Select/deselect one image, a group of consecutive images, or all images in the current folder from the Grid/Filmstrip, or invert the selection. 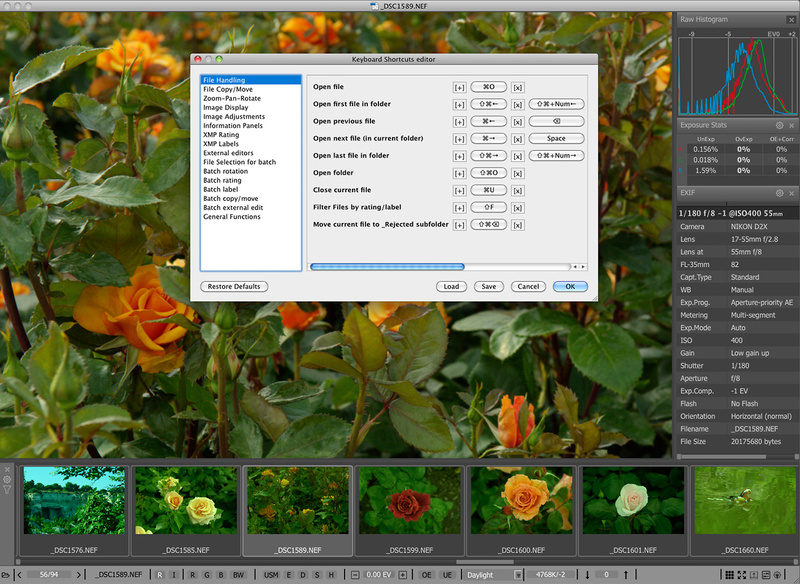 Rotate, assign label and rating, copy, move, run in an external program or move to Rejected subfolder one image, a group of images, or all images. Ratings and Labels, as well as Titles and Descriptions, are recorded in XMP files and are acknowledged by RAW converters that support them. Displayed files can be filtered using label and ratings combinations. Files can be sorted via different criteria, which are chosen in Preferences. If it is necessary to continue work with the selection later, it can be saved to a file and then loaded from the file or appended to currently-marked files. 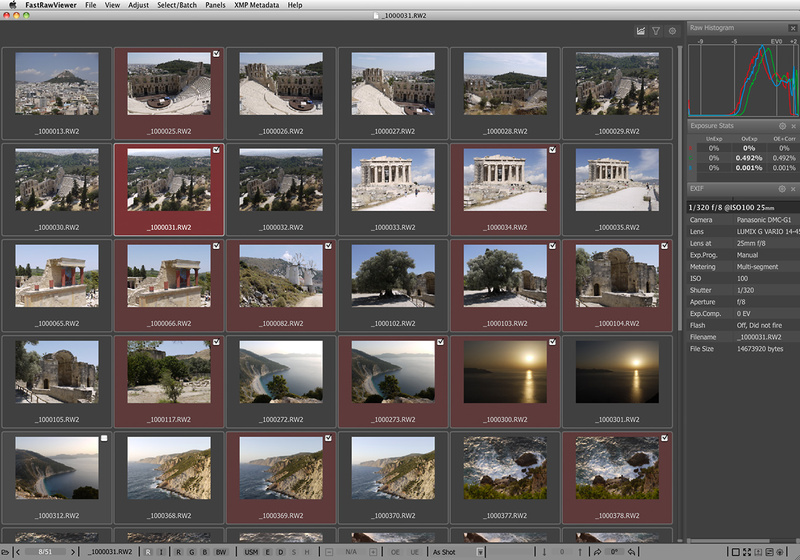 With one click you can switch between RAW, embedded (internal) and external (from the Pair RAW + JPEG) JPEGs together with their histograms. To see a specific part of the displayed image one can zoom in and out on it (as well as view it in actual size and fit it to the window), and pan and drag. Want the Image Area Bigger? To increase the image area use full screen mode. All panels can be closed (the Tab key toggles them open and close) or moved onto another monitor. Customizable EXIF Data Display allows one to include and exclude fields and see as much or as little EXIF info for each shot as you want. Check the Keyboard Shortcuts Editor to set shortcuts for actions or download sets, which simulate the shortcuts of some widely-used applications. Use Preferences to adjust interface, tune functionality settings according to your tasks, and increase performance of FastRawViewer. 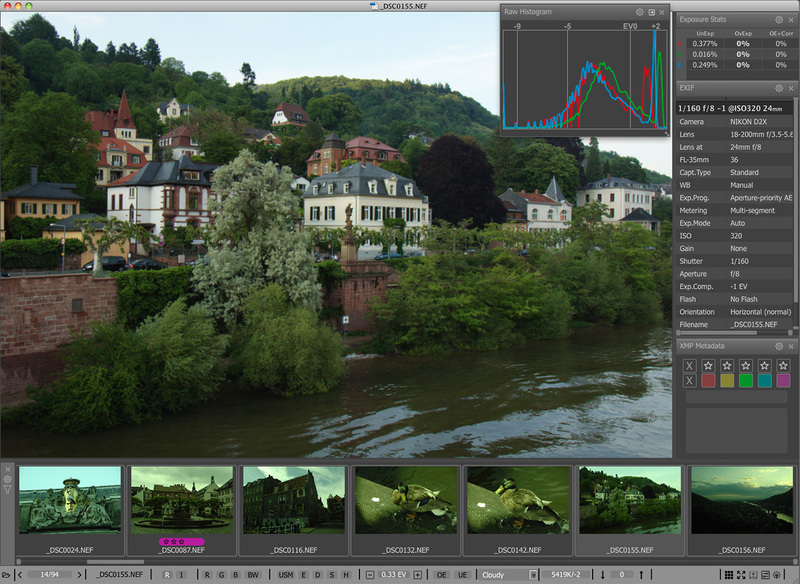 FastRawViewer Color Management System allows one to match image display and color workflow to the monitor one is currently using. 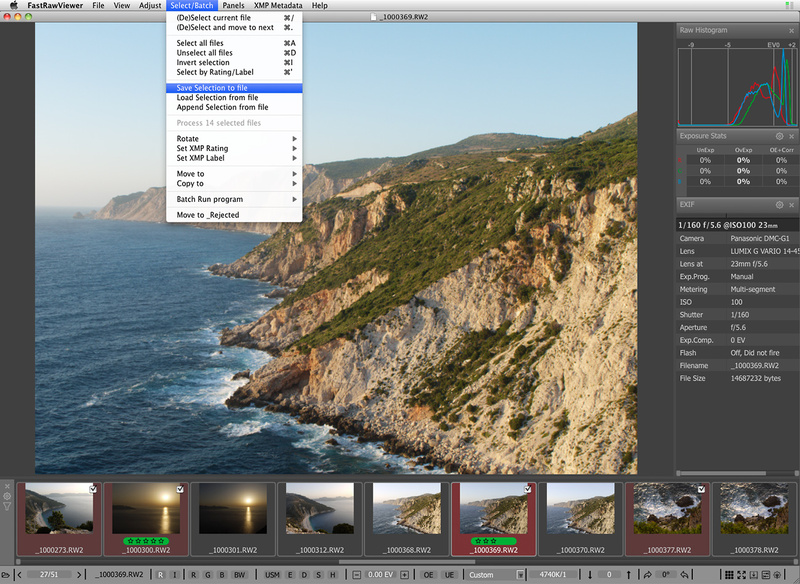 The background and every panel or bar appearance can be tuned using Preferences or a little gear icon at the top right/left corner of a panel/bar. Create and manage a list of often-used folders for quick and readily-available access to them for any future browsing that you may need to do. The license allows you to use the software on two (2) computers simultaneously. The same License Key is valid for both Windows and OS X platforms. * For Sigma Foveon cameras, raw viewing is not supported. ** Testing was performed on desktop computer with i7-7700K CPU @stock clock rate, 32GB RAM, NVidia GTX 1080 GPU and a fast SSD NVMe drive, with a mix of shots from cameras launched between 2014-2018. We recommend fast SSD drives for peak performance.